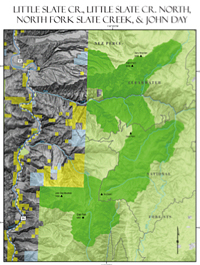 The 6,000 acre Little Slate Creek North portion includes Little Van Buren Creek, Waterspout Creek, and No Business Creek, where a 1,200 acre Research Natural Area is located, containing some of the southernmost growing specimens of maidenhair fern. Composed of very abrupt side slopes and tributary draws ranging from 2,100 feet - 7,291 feet in elevation, most of the undulating land is covered with mixed species of trees and vegetation. Elk, deer, and moose find summer and winter range, and often evade hunters, as the slopes are too steep to easily traverse. Turkeys and chukars, the latter a chicken-like game bird native to Pakistan, were introduced to the region and are still present. If you see a flash of bright blue in the underbrush it might be a native Mountain quail, a region 1 sensitive species. Slate Creek is an anadromous stream, generating ideal waters for steelhead and rainbow trout, Chinook salmon, and Bull trout.